Isn’t that one of the BEST things you can eat to shed stubborn pounds? Fruit is delicious, but it isn’t a “free pass” in your diet. A lot of people treat it that way though. They’re strict about ditching unhealthy processed foods. But they let themselves eat as much fruit as they want. But you still have to eat something. You have to replace some of those calories you eliminated from your diet. Protein and healthy fats are ideal, but people struggle to get enough of them. So they end up snacking all the time, filling up on fruit to fight off hunger pains. “Fructose” is a natural sugar found in fruit. It’s much better than high fructose corn syrup (the stuff found in processed foods). But fructose is still sugar. Eat too much, and you can get yourself into a world of trouble. When you eat fruits, your body processes the fructose in them quickly. This spikes your blood sugar levels, and your body releases a hormone called insulin to get things under control. Do this repeatedly, and your body adapts by becoming RESISTANT to insulin! Things only go downhill from there. Insulin resistance has been linked to obesity—the last thing you want to hear if you’re trying to lose weight. It’s also been linked to diabetes, kidney disease, and even heart disease. Hold on. I Thought Fruits Were Healthy! What’s the Deal? Fruits have plenty of vitamins, minerals, and antioxidants to write home about. As long as you aren’t eating too many of them, they fall under the “healthy” foods camp. But not all fruits are created equal! Some are sweeter than others. They have a high fructose content and a high “Glycemic index” (which measures food’s impact on your blood sugar). And if you’re going to eat fruit, stick to whole fruit. Eating whole fruit gives you get plenty of fiber with the fructose, which helps your body process the fructose more slowly. This is easier on your blood sugar and keeps you feeling full. Fruit juices and smoothies taste delicious, but they’re super easy to overdo. Liquid calories don’t fill you up like whole foods do. You’re essentially drinking “fructose bombs”: entire batches of fruits thrown into a single glass. How Much Fruit Can I Eat and Still Lose Weight? If you spend most of your time in an office and only exercise a little, you’ll probably see faster weight loss by limiting your fruit servings to 1-3 a day. Athletes and physically active people can get away with eating more fruit: 4-5 servings a day is a good guideline. Physical activity helps you do well with more carbs (from fruits and starchy vegetables) in your diet. You can always stop eating fruit until you reach your target weight. Then you can gradually reintroduce it into your diet. Until then, you can get all of the nutrients you need from vegetables. 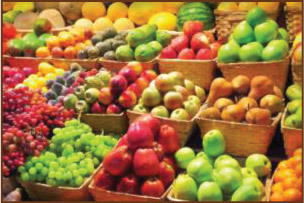 No matter how much fruit you eat, don’t let it replace animal protein and vegetables as the pillars of your diet. But it’s just one piece. In order to lose weight—and keep it off—you need a proven roadmap to follow. Your health is at stake. You don’t have time to waste on another fad diet or trying to figure things out on your own. The Pete's Paleo Eats gives you that roadmap. It gives you the knowledge you need to shed stubborn weight, as well as the practical tools to put that knowledge into action.